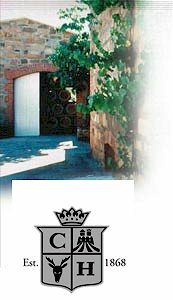 The wines are made using traditional techniques and a hands off philosophy to create wines full of character. Proud of the region's German heritage, the brand was named in honour of Count Ferdinand von Zeppelin, a brave and progressive man who thought big, really big. Yalumba was founded in 1849 by Samuel Smith, British migrant and English brewer, who had brought his family to Angaston seeking a new life. After purchasing a 30-acre parcel of land just beyond the southern-eastern boundary of Angaston, Smith and his son began planting the first vines by moonlight. Samuel named his patch Yalumba, aboriginal for 'all the land around'. Wolf Blass Wines International was born in 1973 when Wolf started his own business, purchasing a 2.5 acre land holding with an old army shed outside Nuriootpa, at the northern end of the Barossa Valley. John Glaetzer joined the company and from 1974-1976 Wolf Blass Wines won three consecutive Jimmy Watson Trophies, the Black Label generated substantial publicity and hype. From this time onwards growth was impressive with Wolf Blass Yellow Label and Riesling becoming Australia's top selling red and white wine. Michael came to the wine industry from a construction background having spent years attending wine tastings and collecting the wines of the world. 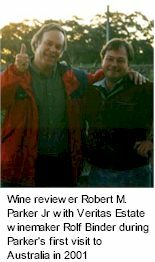 In 1998, he established his own Australian wine export company and after three successful years of selling other people's wine, he and business partner Richard Mintz decided to start their own operation. In 1982 Trevor was appointed head winemaker and remained in that position until 1986. During Trevor's time at Karrawirra he also made wines for Kellermeister. 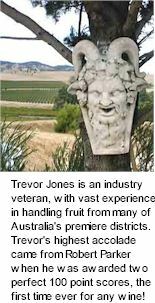 At the end of 1986 Trevor moved to the Upper Hunter Valley, in NSW, to take up employment as winemaker for Tyrrell's Vineyards at their Glenbawn Estate Winery. In 1989 he returned to the Barossa Valley as full time winemaker at Kellermeister. 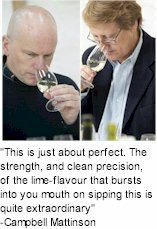 During his time at Kellermeister, Trevor also worked as a consultant for Anglesey and Glenara. Trevor was also employed by St. Hallett as a contract winemaker during eight vintage seasons. Torzi Matthews, a food and winemaking partnership between Domenic Torzi and Tracy Matthews, are driven by a passion and firm conviction in appreciating the value of heritage tradition in the crafting of their wines and extra virgin olive oils. Domenic Torzi is a fifth generation Calabrian - Abruzzese, he grew up on the Adelaide Plains working for the family's market gardens. Tracy Matthews was born and raised in Sydney’s Newcastle, she has a long career in hospitality. 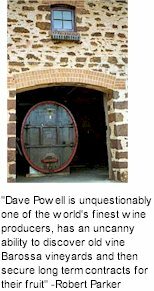 Torbreck founder David Powell was immersed in the study of Economics at Adelaide University, when an uncle introduced him to wine. Young Dave realized that grapes could be more intriguing than numbers. He began spending more and more of his spare time in the Barossa Valley and during the winters, he availed himself of the opportunity to venture overseas to work harvests in California and Italy. He travelled throughout the famous wine regions of Europe and even spent time in Scotland as a lumberjack. 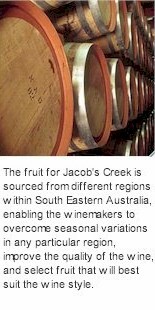 This experience was instrumental in illuminating the unique attributes of the Barossa, at a time when others felt its heritage was past the sell by date. 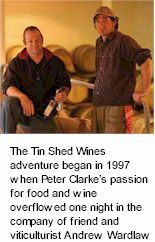 The Tin Shed Wines adventure began in 1997 when Peter Clarke’s passion for food and wine overflowed one night in the company of friend and viticulturist Andrew Wardlaw. Peter is head chef and part-owner of the award-winning Vintners Bar & Grill near Angaston. The Barossa Valley was settled in the early 1840s by small farmers and artisans seeking religious freedom from their native Silesia. The warm, fertile valley was ideal for ripening winegrapes and Australia's largest wineries made their headquarters amongst the vineyards. In the cooler ranges above the Barossa, known as Eden Valley, English settlers created large pastoral runs for sheep and cattle, but also planted vineyards to ensure a supply of table wine. David and Barbara Bruer established a small vineyard in the early 1970s at a property situated on the main road between the towns of Strathalbyn and Milang, in the grapegrowing district of Langhorne Creek. David was in charge of Roseworthy College's Oenology Department before becoming a full-time vigneron, while Barbara also taught chemistry at Roseworthy College and Flinders University for ten years. Fruit was initially sold to other appreciative winemakers. Gradually increasing quantities of wine came to be vinified on the property under the Temple Bruer label since the late 1970s. David and Barbara also established a vine nursery, using the property’s fertile soil to produce rootlings for sale to other growers. The tale of Taylors winemaking goes back a few years – three generations in fact, and all began with Bill Taylor Senior, and his love of a certain Bordeaux wine. Originally wine merchants in Sydney, a passion for wine was all part of being a Taylor, and in particular, for the famous French Clarets such as Chateau Mouton Rothschild in Bordeaux’s Medoc region. It was this long held fascination for these wines which inspired the family’s foray into winemaking, and provides the inspiration and winemaking philosophy behind all Taylors winemaking today – to produce premium wines of exceptional and comparable quality in Australia. Evolution in the pursuit of excellence has been a consistent thread running through St Halletts history resulting in benchmark wines, recognised around the world as quintessential Barossa. 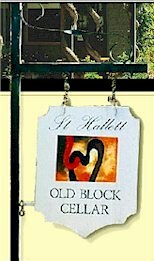 As one of the founding wineries of the region and in the strength, warmth and honesty of its wines, St Hallett has come to be regarded as quintessential Barossa. Spinifex make small quantities of unique hand crafted regional wines from the Barossa and Eden Valleys. Spinifex are typically blended, as a more complete and complex, unique and characterful wine can be assembled from components that are the result of the interaction between variety, soil and meso-climate. Peter Schell makes all the wines at the estate winery in Bethany, Tanunda, where he also runs his own winemaking consultancy company. 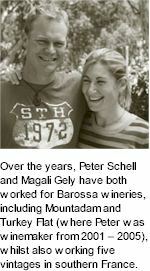 Over the years, the pair have both worked for Barossa wineries, including Mountadam and Turkey Flat (where Peter was winemaker from 2001 – 2005), whilst also working five vintages in the South of France. In 2001 Peter and Magali decided to start making their own wines, sourcing grapes from five old Barossa vineyards to complete about 400 cases in that first year. Formed in 1998 Soul Growers is the work of four good mates, Westy Cruickshank, Paul Heinicke and the Lindner Brothers. Together, they share eighty years wine industry experience and have benefited from the knowledge generously shared by some of the Barossa’s pioneers and legends. Soul Growers stand for everything that is great about the Barossa, shared wisdom, new ideas, mateship and a passion for making and enjoying great wine. Truly handcrafted winemaking from small batches and quality Barossa vineyards. 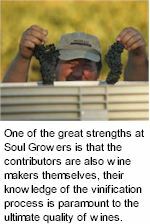 One of the great strengths at Soul Growers is that the contributors are also winemakers themselves, their understanding of the vinification process is paramount to quality. With this in mind, they strive to make sure Soul Growers wines emphasise the regional and varietal flavours of their beloved Barossa Valley. Sons of Eden takes its name from the two partners, Winemaker Corey Ryan and Viticulturist Simon Cowham, who both learned and refined their trades in the vineyards and cellars of Eden Valley. A trained Oenologist and self confessed wine tragic, Ryan lives and breathes winemaking and has amassed a wealth of winemaking experience across Australia, New Zealand, France, Italy and Spain. 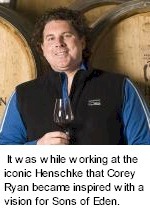 Most recently, Corey has consulted to several winemaking businesses in Australia and overseas, which have included Villa Maria and McWilliams Wine Group. He built a stone house for his family naming it Mamre Brook, after Abrahams spiritual home in the book of Genesis. Mamre Brook House still stands today as the spiritual home of Saltram. William Salter and Sons first planted grapes here in 1859, and in 1862 produced 8000 litres of a wine appropriately named No.1 Shiraz. In the history of Saltram there have only been eight senior winemakers, two families dominate the list, Salter and Dolan. Three generations of Salters made wine until 1937, and the Dolan's have played a part at Saltram from the 1950s through until today. Rolf's story begins in 1950 when his parents arrived from Austria and Hungary, part of the large influx of post war immigration to Australia. They worked with the Victorian railways for three years. 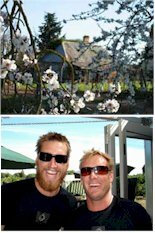 During that time they met Elmore Schulz a train driver and a grape grower in the Barossa Valley. In 1953 they picked grapes in the Barossa, met Chris Vohrer and Wilhem Abel and in 1954 worked a vintage in their winery. This is the old winery on Langmeil Road, which they purchased in 1955. All operations are carried out on a single site located near Tanunda, in the heart of the internationally famous Barossa Valley, South Australia. Peter Lehmann Wines has earned many medals and trophies along with great accolades from wine judges in Australia and throughout the world. Now a public company of international repute, Peter Lehmann Wines is regarded as one of Australia's pre-eminent wine brands. 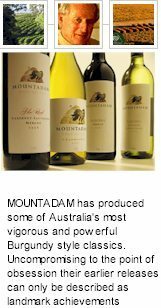 Mountadam is in the Eden Valley which neighbours the Barossa Valley. It takes approximately 1 hour and 15 minutes to reach the Mountadam Winery from Adelaide or 20 minutes from the larger towns of the Barossa Valley such as Angaston or Tanunda. The property was identified after David's exhaustive search of potential sites throughout South Eastern Australia. When Robert Hill Smith from Australia's oldest family owned winery Yalumba, joined forces with Clare winemaker extraordinaire, Jeffrey Grosset to create a new Eden Valley Riesling, it was clear that this would be no ordinary wine. Jeffrey Grosset needs no introduction. 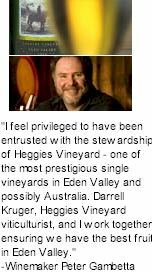 His Polish Hill and Watervale Rieslings are highly prized Australian wines. The Hill Smith's Pewsey Vale Riesling is now regarded by many as a benchmark Australian estate Riesling. On a brightly moonlit Tuesday evening at around eleven o'clock on the Barossa to Clare road, two young blokes are cruising their way to work the midnight shift for the last vintage of the century, in a beat-up old Toyota Corolla. During the drive home, they would often crave a soft slurpy wine to wash down a hard night's work. Out of this ideal they decided to join forces and make a Grenache based wine to be enjoyed whenever the mood would take hold. As such Massena Vineyards first wine The Moonlight Run Grenache Shiraz Mataro Cinsault was born. Among the many personalities that have shaped the Australian wine industry over the past 150 years one name stands pre-eminent, Leo Buring. Hermann Paul Leopold Buring was born in South Australia on the 7th October 1876, the son of German immigrants. He was a highly skilled winemaker and is often described as Australia's Ambassador for Wine because he was one of the first to export Australian wine to many countries as far back as the early 1900s. He sent his chief clerk, Charles Flaxman, to Prussia and, after a favourable report, chartered two ships to take the migrants from Hamburg. As each ship arrived in Adelaide, the emigrants were dispersed to various settlements in the vicinity. 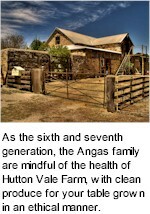 After much negotiation, Pastor August Kavel secured land in the Barossa Valley to congregate the migrants, and in 1842 the village of Langmeil was established. Ralph was National Marketing manager at Orlando wines for fifteen years prior to founding his own estate. Kellermeister have been handcrafting wines at their boutique winery for a long time now. It all began in the late 1970s as Ralph and Val Jones sat with gum boots on, ankle deep in water, labouring tirelessly into the night together. Over many cold winter’s nights, in a small tin shed perched above the valley floor, they laboured - kept warm only by the glow of the love they shared and the fire that was their dream for Kellermeister. Their aim was to produce wines of unique character - wines true to the German traditions of the Barossa Valley which was so richly influenced by the Silesian settlements of the 1840s. And so it was, through much love, sacrifice and hard work that Ralph and Val Jones brought their dream to life. He has been saluted many times on the world stage, notably International Winemaker of the Year 1989 and twice Red Winemaker of the Year in 1991 and 2000. After 29 years as a winemaker with Penfolds, one of the world's most famous wineries, John Duval embarked on his own wine label in 2003. John believes he has indeed been fortunate throughout his career, graduating in agriculture and winemaking in 1973 at Adelaide University. John has followed in the footsteps of some of the greats of Australian winemaking such as Max Schubert, the creator of Penfolds Grange and Don Ditter, another famous Penfolds winemaker of the 1970s and early '80s. Colonel William Light, who surveyed the city of Adelaide in 1836, made his way northeast to the Barossa Valley, which he named after an English victory in the south of Spain during the recent Napoleonic Wars. Later, when William Jacob surveyed the Barossa in 1839, he and his brother John took up land in the Hundred of Moorooroo; a word derived from the aboriginal meeting of two waters The two waters involved were the North Para River and a creek, which fed into it. The creek was later named Jacob’s Creek after William Jacob. Today, the Jacob brothers small cottages still stand, overlooking Jacob's Creek. Established in 1988, Grant Burge Wines has grown to become one of the top 10 privately owned wine companies in Australia. The company has a strong commitment to its loyal Australian consumers and also energetically pursues overseas markets in the United Kingdom, Europe, Canada, the United States and Asia. Grant Burge is a fifth generation winemaker absolutely committed to the Barossa Valley. He strongly believes that fine wines are born in the vineyard and that vineyards are the cradle of wine quality. 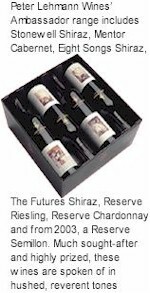 A specialist producer of limited quantities of premium table wines, it is fast garnering a reputation as a reliable producer of richly flavoured and complex wine. Owned by Rob Gibson and wife Anne, the tiny operation produces a mere 4000 cases of wine. Fruit is sourced from predominantly estate grown fruit with a small amount coming from contracted grower fruit for added diversity come blending time. 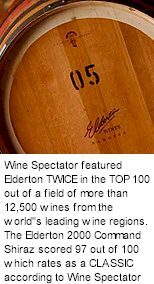 Winner of Australia's most coveted wine award the Jimmy Watson Memorial Trophy (1993) and the prestigious London International Wine & Spirit Competition's World's Best Shiraz Trophy (2000), Elderton remains proudly owned by the Ashmead family. The Elderton Vineyard is located on the banks of the North Para River, which is on the southern edge of the township of Nuriootpa. 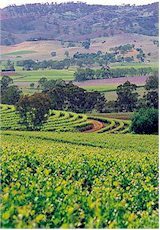 The Barossa Valley's climate is classified as Mediterranean, which amounts to warm summers (average temperature in January is 25°C to 35°C) and cool wet winters with an annual rainfall of 550 mm. 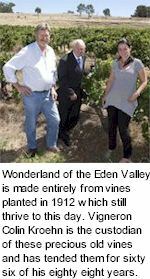 The vineyard was planted in 1904 by Samuel Elderton Tolley, with a view to supplying Barossa wineries with premium fruit. After a period of neglect, the Ashmead family purchased the vineyard in 1979 and went about restoring it to its former glory. 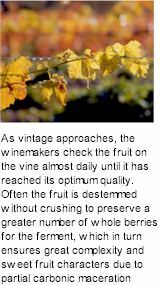 Modern viticulture practices were employed and the vineyard began to flourish. Their vineyards are family, their wines are children. Serious stuff, certainly. Proper fun, absolutely. The lifelong search to appreciate and understand the essence of wine, its terroir, leads to a vinous treasure hunt, following the Dandelion's wishing clock if you will, that always inspires. Dandelion Vineyards are proven plantings that have stood the test of time.